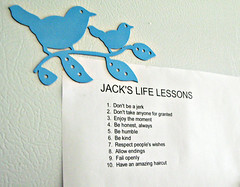 life lessons, by jack handey... er, Dorsey. think i fail on #1, #5, #10.
most of the others, i do ok.
kind of exceptional on #3 and #9, in fact. For example, what does 'don't be a jerk' mean? Is anyone ever a jerk, except in regretful retrospect!